You must be a member of the Utrecht Culture Club Group to attend this activity. Would you like to join this group? It is the performance at Glyndebourne in Protected content Anne Sofie von Otter, Marcus Haddock, Laurent Naouri, and Lisa Milne, with the London Philharmonic Orchestra conducted by Philippe Jordan. The production is by David McVicar. Anne Sofie von Otter sings the name role of Carmen. Her acting matches the excellent quality of her singing. Set in Seville around the year Protected content , the opera deals with the love and jealousy of Don José, who is lured away from his duty as a soldier and his beloved Micaëla by the gypsy factory-girl Carmen, whom he allows to escape from custody. He is later induced to join the smugglers with whom Carmen is associated, but is driven wild by jealousy. This comes to a head when Carmen makes clear her preference for the bull-fighter Escamillo. The last act, outside the bull-ring in Seville, brings Escamillo to the arena, accompanied by Carmen, there stabbed to death by Don José, who has been awaiting her arrival. 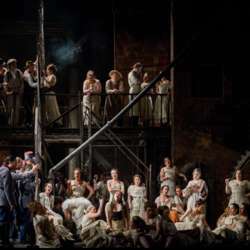 Carmen, the most famous of Bizet's operas, with its exotic Spanish setting, introduced a note of realism into opera that proved unacceptable to many who saw the first performances. Objection was taken to the wild and immoral behaviour of Carmen, the chorus of cigarette factory- girls and their smoking and the final murder of Carmen on the stage. The running time is about 2 hours and 40 minutes. It is sung in French with subtitles in English. We shall have a break sometime in the middle. You will also get a copy of the story of the opera in English. Glyndebourne is an English country house near Lewes, south of London. It is the site of an opera house that, since Protected content , has been the venue for the annual Glyndebourne Festival Opera. Initially, operas were presented within the house but there is now a free-standing opera house on its grounds.